Vainguinim Valley Resort is 5 miles from Goa’s capital, Panjim. It offers restaurants, an outdoor pool and bar, a casino, spa, gym and BBQ facilities. Free parking is available. 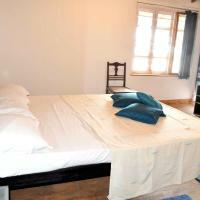 Rooms are equipped with air-conditioning, cable TV, a minibar and coffee/tea makers. India’s largest casino is located in the Vanguinim Valley Resort. A spa, sauna and fitness center are also available. Guests can dine at the Vanguimim Valley Resort’s Chances Café, The Pan Asian and Gold Rush restaurant. The poolside bar also offers snacks and drinks. Vainguinim Valley Resort is a 2 minute walk from Vainguinim Beach and 18.5 miles from Dabolim International Airport. Goa Marriott Resort & Spa offers luxurious 5-star accommodation, featuring a casino, outdoor pool and spa. Offering 3 dining options and free parking, it is a 2-minute drive from Kala Academy Pier. Featuring spacious layouts, Marriott Goa’s air-conditioned rooms have stunning views and DVD players. For convenience, a safe, ironing and tea/coffee making amenities. Private bathrooms have hot/cold showers and a hairdryer. Regular workouts can be maintained at the fitness centre. For leisure, there is a tour desk that organises day trips and a salon. Goa Marriott Resort & Spa also provides business services. All-day dining with international dishes is available at AZ.U.R. Specialising in Mediterranean dishes, Waterfront Terrace offers outdoor dining with poolside views. Other options include Wan Hao Asian restaurant, Simply Grills and 24-hour room service. Located in the business hub of Panaji, Goa Marriott Resort & Spa is a 40-minute drive from Dabolim Airport. Sandalwood Hotel & Retreat is located in Dona Paula, a short 3-minute walk from Vainguinim Beach. It offers 4 dining options, free Wi-Fi and an outdoor pool. The hotel is 30 km from Dabolim Airport and 21 km from Karmali Railway Station. Panjim Shopping Area is 7 km from the hotel while Chance’s Casino is just next door. Rooms at Sandalwood come with private balconies and air-conditioning. 24-hour room service, flat-screen TVs and a personal safe are provided. Free morning newspapers are available upon request. Guests can exercise at the well-equipped fitness centre or find entertainment at the games room. Sandalwood Retreat also provides car rentals and a tour desk. Sea Pearl Restaurant serves local, Asian and international dishes. Tea and snacks can be enjoyed at the poolside Upper Coast Café. Drinks and cocktails are available at Caitan ‘n’ Joe Bar and Salud Latino Bar. The Crown Goa offers 5-star accommodation with breathtaking views of Mandovi River. It features an outdoor pool, a day spa and 2 restaurants. The spacious rooms include free internet. The Crown Goa Hotel is located in Panaji, the capital of Goa. The beautiful Miramar and Caranzalem beaches are just a 10-minute taxi ride away. Candolim is a 20-minute drive. Guests can relax in air-conditioned comfort and enjoy views of the garden, city or river. All rooms include a flat-screen TV with cable channels and a refrigerator with minibar. Entertainment options at The Crown include a game room with pool table. Sightseeing can be arranged at the tour desk. The poolside Hanging Garden Restaurant serves barbeque and Indian dishes with river views. Harbour Cafe offers international cuisine. Room service and a breakfast buffet are available. A 10-minute drive from Old Goa and Miramar Beach, this hotel houses a fitness center and 2 dining options. It offers Wi-Fi access throughout its premises and free on-site parking. Situated behind Kadamba Panjim Bus Stand, Ginger Hotel Goa is 20 miles from Dabolim Airport. Fitted with hardwood floors, modern air conditioned rooms are equipped with a flat-screen TV and a personal safe. Coffee/tea making facilities and a minibar are included. Private bathrooms come with shower facilities and toiletries. Square Meal Restaurant is a multi-cuisine restaurant which serves new menu items daily, while Café Coffee Day offers coffee and refreshments. The hotel also has a drinks vending machine. Ginger Hotel provides water dispensers on each floor. Guests can use the business center, or make travel arrangements at the tour desk. The 24-hour front desk provides car rentals and a currency exchange service. L Hotel Eden is located on the slopes of Donapaula, a short walk from Donapaula Beach. The stylish 4-star hotel offers an outdoor pool, a fitness center and free parking. The spacious guest rooms of L Eden feature a modern interior. Each well-furnished room has a minibar, an in-room safe and a flat-screen TV with cable channels. Hotel L Eden offers laundry and dry cleaning services. Safe deposit is available at the 24-hour front desk. Other services available include currency exchange and car rental. Luna Restaurant serves a variety of international dishes and light refreshments. L Hotel Eden is 4 miles from Panjim City Shopping Center. It is 6 miles from Karmali Train Station and 17 miles from Goa International Airport. Located in the heart of Panaji, Marigold Hotel is located along the picturesque banks of Mandovi River. It features modern rooms decorated in soothing pastels, equipped with flat-screen TVs. Hotel Marigold is 800 ft from Panjim Kadamba Bus Stand and 2 miles from Miramar Beach. Dabolim Airport is 18 miles away. Marigold’s rooms come equipped with minibars and tea/coffee makers. Ironing facilities and electric kettles are provided. Private bathrooms offer toiletries and a hairdryer. Select rooms offer sea views. The hotel offers car rental and currency exchange services. Guests can do their laundry and dry cleaning in the hotel. Sightseeing arrangements can be made at the tour desk. Tulip Restaurant serves vegetarian cuisine prepared with fresh herbs and spices. 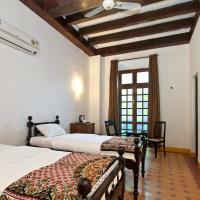 Panjim Inn is housed in a charming building in the heart of Latin Quarter of Fontainhas. Offering free street parking, it also has a 24-hour front desk and restaurant. Free Wi-Fi is available throughout the property. WelcomHeritage Panjim Inn is situated 500 metres from the Church of Immaculate Conception and 1 km from Panjim town centre. Miramar is 4 km away. Rooms come with cable TV channels and offer a minibar and tea/coffee making facilities. A safety deposit box and work desk is provided. Verandah Restaurant serves a delightful range of local dining favourites and European cuisine. Guests can enjoy street views from the restaurant. Guests of the hotel can make sightseeing arrangements at the tour desk. Car rental and currency exchange services are also available. This charming heritage property features uniquely furnished rooms with antique wood fittings and lace curtains. Built in the 18th century, it houses an art gallery and a restaurant with a veranda overlooking the street. These spacious rooms feature wood-carved canopy beds and rosewood dressers. Fitted with cable TV and a tea/coffee maker, they come with a private bathroom that has mosaic tiles and a bathtub. Situated in the heart of Panaji, Welcome Heritage Panjim People is 800 metres from the historic Church of Our Lady of Immaculate Conception. It is 8 km from Miramar Beach and 30 km from Dabolim Airport. For leisure, guests can browse the gallery’s collection of modern Indian and overseas paintings. The hotel also provides laundry and tour services as well as free parking. Verandah Restaurant offers a variety of local and Western dishes. A 5-minute walk from Goa’s Hawaii Beach, Casa Amarilla offers spacious air-conditioned accommodation with a private balcony and 29-inch cable TV. Guests who drive enjoy free parking. Featuring classic wooden furnishings, rooms at Amarilla Casa have plenty of natural light. Included in all rooms are a kitchenette and dining area. Shower facilities and toiletries are in the en suite bathroom. Travel bookings can be made at the tour desk. Laundry and dry cleaning services are also available upon request. Casa Amarilla is a 2-minute walk from Dona Paula Jetty and 7 km from Panjim City. Karmali Railway Station is 20 km from the hotel. Located in the City Centre, the modern Vivanta by Taj Panaji enjoys views of the Mandovi River and Altinho Hills. Providing a rooftop pool, it also has a 24-hour gym and pampering massage at Jiva Spa. Free parking is available. Fitted with hardwood flooring and a day bed by the large windows, air-conditioned rooms are equipped with a 32-inch flat-screen TV and DVD player. A well-stocked minibar and an ergonomic work desk are included. Bathrooms have a separate bathtub and rainshower. Vivanta by Taj Panaji is 28 km from Dabolim Airport. A free airport transfer can be arranged upon request. The 24-hour business centre provides services like laptop rentals. Guests with pets can request for toys, food bowls and grooming services. Day trips can be arranged at the tour desk. Latitude serves a selection of North Indian, Goan and Italian cuisines. Other dining options include Pan-Asian food at Tamari, desserts at Caramel and cocktails at Tease Bar. Mitaroy Goa Hotel is located in the UNESCO Heritage Zone of Fontainhas, a 5-minute walk from Mandovi River. The hotel features couples-only suites offering a traditional Goan breakfast served daily at the time of guests' choice. Free internet access is available in public areas. Air-conditioned suites come with with a lounge, separate bedroom and dining area. A balcony or patio, as well as a free minibar, are included. The en suite bathroom comes with a shower and hand-made toiletries. MItaroy Goa Hotel is a 10-minute drive from the Miramar Beach and 30 km from Goa International Airport. Parking on-site is free. The staff at the tour desk can assist with making travel arrangements. Laundry services are offered. Breakfast includes freshly baked Goan bread, Goan salted butter and seasonal fruits. Jam, marmalade and freshly brewed coffee are also served. Hotel Solmar is a 10-minute walk from the Miramar Beach and 4 km from the Panjim City. It offers 2 dining options, outdoor swimming pool and free parking on site. Air-conditioned guest rooms are fitted with cable television. The en suite bathroom comes with hot/cold shower. The staff at the tour desk can assist with making travel arrangements. Laundry services are on offer. The on site restaurant serves a variety of Indian dishes. Drinks and light snacks can be found at the bar. Solmar Hotel is 14 km from Karmali Railway Station and 32 km from the Dabolim Airport. Overlooking Mandovi River, Hotel Manvin's is located 1 km from Panaji Bus Stand. It offers 2 dining choices and air-conditioned rooms with a cable TV. Free parking is provided. Manvin’s is 12 km from Karmali Railway Station and 30 km from Dabolim Airport. Cosy rooms are equipped with a seating area, work desk and wardrobe. Shower facilities are available in the en suite bathroom. Guests can sample a variety of Indian, Chinese and continental dishes at the restaurant. Fine wines and imported beverages are available at the bar. With a 24-hour front desk, staff can assist with luggage storage services, while travel bookings can be made at the tour desk. Laundry, dry cleaning and ironing services are also available upon request. 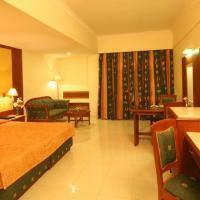 Located in Panjim Goa, Hotel Park Plaza offers stylish air-conditioned rooms. Facilities include a business centre, a tour desk and a 24-hour front desk. Staff can help guests arrange dinner cruises, as well as sightseeing trips. The hotel is1 km from Karmali Bus Terminal and 12 km from Karmali Railway Station. Dabolim Airport is 30 km away. Overlooking the historic Azad Maidan, rooms at Hotel Park Plaza are elegantly furnished with contemporary decor. Each well-appointed room is equipped with a flat-screen satellite TV and an en suite bathroom. For guests’ convenience, the hotel provides luggage storage, currency exchange and car rentals. Laundry and concierge service are also available. The hotel’s restaurant offers a wide variety of Indian dishes for breakfast. Room service can be arranged upon request. Situated in the heritage area of Campal, Vivenda Rebelo is a homestay housed in a refurbished 100-year-old Indo-Portuguese building. Located in front of Francisco Luis Gomes Garden, the property is about 4 km from Kadamba Bus Station and 12 km from Karmali Railway Station. Dabolim Airport is about 28 km away. Air-conditioned rooms feature cable TV and an en suite bathroom with hot showers. A mini fridge and hot water kettle are included. There is a living room and dining area with a TV set, where guests can spend time with the homestay host and family. The Goan homemade meals are served here. Ocean Suite is located in Donapaula Goa, just 10 minutes' drive from Miramar Beach & Donapaula Beach. Guests can enjoy access to an outdoor pool, as well as a common laundry area and kitchen. Surrounded by palm and coconut trees, all rooms come with an outdoor seating area and private entrance. Spacious and well-furnished, all the air-conditioned guestrooms come with a flat-screen TV, personal safe and tea/coffee making facilities. En suite bathrooms are equipped with a shower. Ocean Suite is a 10-minute drive from Donapaula Sporting Club. It is a 15-minute drive from Panaji City, Goa's capital city. Dabolim Airport is a 45-minute drive away. On-site parking is free. Free Wi-Fi is provided in public areas. In the kitchen, guests can make use of the microwave and toaster. Day trips and airport transfers can be arranged upon request, at a charge. A daily breakfast is provided by the property, as well as evening tea and coffee. Guests can also order food from nearby restaurants. 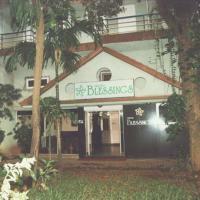 Situated 3 km from the Panaji Bus Stand and Miramar Beach, Hotel Blessings offers free Wi-Fi access in its public areas. The hotel is 13 km from St. Francis Xavier Church and 15 km from Karmali Railway Station. Calangute is 17 km away, while Dabolim Airport is 35 km away. Fitted with a balcony, rooms feature cable TV, a telephone and an attached bathroom with hot and cold water supply. Room service is provided. Guests can head to the 24-hour front desk for assistance with luggage storage, laundry or car rental services. Bus and railway bookings can also be arranged. Located on the banks of Mandovi River, Hotel Mandovi features 4 dining options and offers comfortable rooms with balcony. Free Wi-Fi access is available throughout the property, while complimentary private parking is provided on site. The hotel is conveniently within 1 km from Kadamba Bus Terminal and 2.5 km from the beautiful Miramar Beach. Karmali Railway Station is situated 15 km away, while Dabolim Airport is approximately 30 km from the hotel. Air-conditioned rooms are simply furnished with a wardrobe, a personal safe and a flat-screen satellite TV. An electric kettle and telephone are also included. En suite bathrooms come with shower facilities. Operating a 24-hour front desk, Hotel Mandovi provides currency exchange, laundry and car rental services. The tour desk can assist with bookings of sightseeing excursions and travel arrangements. 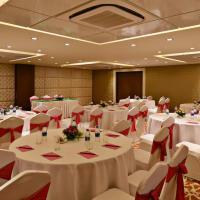 Meeting/banqueting facilities are also available. Riorico Restaurant serves Goan & Portuguese cuisine, while Goenchin Restaurant offers a menu of Chinese dishes. Set just a few feet from the blue waters of Goa's Hawaii Beach, The Hawaii Comforts features well-furnished rooms with air conditioning and free Wi-Fi access throughout the property. Located just under 1 mile from Miramar Beach, the property is also 2.5 miles from Panjim Market. Dabolim Airport is 17 miles away with shuttle services available for a fee. The modern rooms are fitted with a flat-screen TV with satellite channels, a closet and a minibar. The private bathrooms feature a bathtub or shower facilities. Larger rooms include a balcony. The Hawaii Comforts’ 24-hour front desk will be happy to assist with laundry/ironing services and luggage storage. Travel arrangements can be made at the tour desk. Free parking facilities are also available to those who drive. Guests can enjoy a spread of Indian and Chinese cuisines including vegetarian dishes at the Hawaii Restaurant. Room service options are also available. Situated along the quiet waterfront of Panjim’s Mandovi River, Villa De Penha provides 27 private residences in Goa’s green countryside. It has a fitness centre, a spa and an outdoor swimming pool. Wi-Fi is free in all areas. Guests can relax in the sauna and organise an excursion at the tour desk. De Penha Villa also provides laundry services for guests’ convenience. The apartments are air conditioned and come with modern and spacious interiors and a private balcony. They are equipped with a writing desk, a comfortable seating area and a flat-screen satellite TV. Some rooms enjoy views of the river. The restaurant serves a selection of classic Goan and Jain dishes. Guests can also sample Indian and European food. There are also barbecue facilities on site. Room service is provided on request. The villa is located 10 km from Old Goa and 12 km from Candolim Beach. Dabolim Airport is situated 40 km from the villa, while Thivim Railway Station is located 25 km away. Situated in the quiet town of Panaji just 1 km from Bishop’s Place and 6 km from Miramar Beach, this Portuguese-style property offers accommodation with colourful stained glass window arches. Fitted with wooden flooring, rooms at Royal Phoenix Inn are cooled with either air conditioning or a fan. The en suite bathroom comes with a bathtub. Guests can access Wi-Fi in the public areas for a small fee. The inn's saff can also assist with travel arrangements, laundry and use of safety deposit boxes. 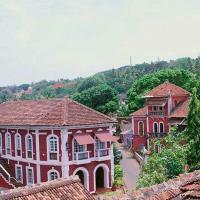 Royal Phoenix Inn is 3.3 km from the Goa State Museum and 3.7 km from the Panjim Bus Stand. Dabolim Airport is 25 km away. 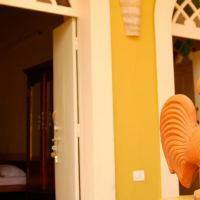 Casa Britona is a charming resort located about 12 km from Calangute Beach and 10 km from Old Goa. It boasts a landscaped garden, cosy seating areas and an outdoor swimming pool. Wi-Fi is available for free in public spaces. The resort is located 36 km from Dabolim Airport and 39 km from Margao Railway Station . The Panaji Bus Stand and Panjim City are situated only 3 km away. The rooms at Casa Britona Resort are beautifully decorated and well appointed with air conditioning, a comfortable seating area and a private bathroom. Some rooms have private balconies offering views of the pool and river. The resort provides laundry and free private parking. There is also a tour desk to help guests explore the region. Britona Restaurant serves a selection of Indian specialities. It also provides an international menu for guests’ convenience. Guests can enjoy their meals in the privacy of their rooms. Hotel Miramar is located just 50 metres from Miramar Beach and provides air-conditioned rooms with en suite bathrooms and comfortable seating areas. The hotel has a tour desk and provides laundry and room services. The hotel is located 35 km from Dabolim Airport and 12 km from Karmali Railway Station. Panjim Bus Station is situated 3 km away. The hotel is about 2 km from Dona Paula and 100 metres from Goa Science Centre. Miramar Hotel’s rooms are simply decorated and come fitted with freshly laundered beddings. They also have a wardrobe, a writing desk and offer views of the city. Some rooms have a flat-screen TV. The restaurant serves a selection of Indian, Chinese and local food. Located barely 4-minute from Panjim Bus Station and 1 km from Panjim Market, Hospedaria Abrigo De Botelho offers elegantly designed cozy accommodations. Free Wi-Fi is available throughout the property. The Hospedaria Abrigo is based in Fontainhas - the latin quarter of Panjim and is 4 km from Miramar Beach and 7 km from Dona Paula Beach. The Basilica of Bom Jesus Church is 11 km. The nearest railway station is the Karmali Railway Station that is 12 km while the Thivim Railway Station is 17 km away from the property. The Goa International Airport is 28 km. The Panaji Bus Terminus is within walking distance. Attached with a balcony, each air-conditioned room comes with a seating area, mini fridge and flat-screen TV. The private bathroom includes shower. The staff at 24-hour front desk helps guests with luggage storage, laundry and dry cleaning. Guests can use the travel desk to seek assistance in sightseeing or rent a car. A bicycle rental facility is available. Room service is available. Featuring a 24-hour front desk, Hotel Fidalgo is a modern property that also houses 4 dining options, an outdoor swimming pool and has free Wi-Fi in all areas. The property is 28 km from Dabolim Airport. Karmali Railway Station is 13 km away. The local casino is barely 500 metres away. The Calangute and Baga Beaches are approximately 13 km away. Hotel Fidalgo is home to a fitness centre, spa and massage centre, steam and sauna and meeting and banquet facilities. Guests can enjoy views of the surrounding areas from the hotel’s terrace or finish work on the go at the business centre. Each air-conditioned room features a seating area and is equipped with a TV, wardrobe and telephone. The attached bathroom has shower facilities. O Goa and Mirch Masala serve pan-Indian cuisine. Aunty Maria is the place to go for cakes and croissants. Chilli N Spice serves Chinese, Continental and Italian fare. Room service options are also available.